A full colour digital display is boasted by this Fossil Q Explorist Gen 4 men's watch. Check the time, date, heart rate and alarm at a quick glance, illuminated on a classic black dial. Personalise your dial, control your music and receive text, email and even social network notifications from your smartphone with this Gen 4 smartwatch. With built-in GPS and NFC features, this Gen 4 model has got you covered on the go! A durable black colour stainless steel case sits proudly on a co-ordinating black silicone strap, ideal for someone always on the go! 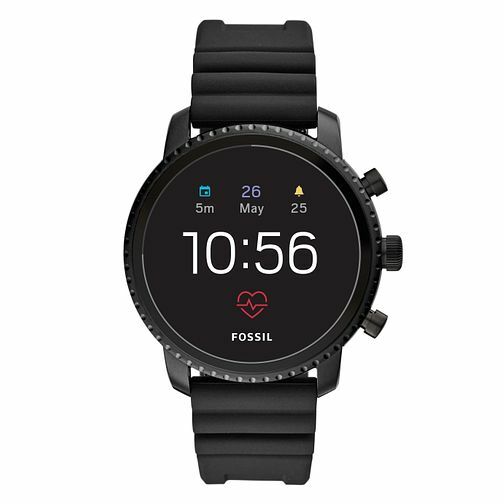 Fossil Q Explorist Gen 4 Digital Black Silicone Strap Watch is rated 1.0 out of 5 by 1. Rated 1 out of 5 by Anonymous from Initial product delivered was not good and slow customer service! Ordered online. First item received was dusty, box was damaged and there were no tags on the watch. Looked like it was a return. Also the charger was missing. Had to arrange an exchange on the phone. Was on the phone for around 40 mins waiting. Travelled to my local shop to do the exchange which sort of defeats the benefit of shopping online. The lady in the Reading shop said there's no way they would have sent the first one out in the state that I received it. Normally give Samuels a wide berth and I fear I'll be going back to that philosophy.